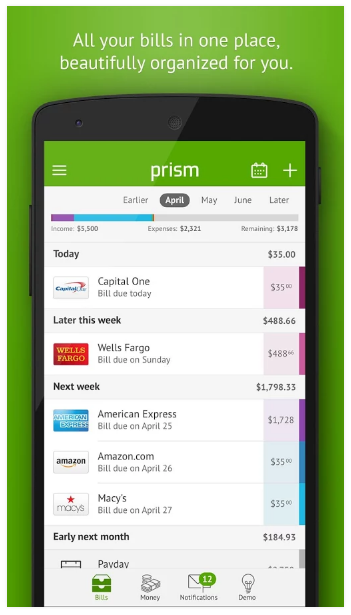 Prism is sort of an all-in-one app when it comes to personal finances. Through the app, users can not only monitor their funds but also pay bills and keep track of things like confirmation numbers (which I never write down) and due dates. It provides a visual outline of what you’re spending (in both list and calendar form). You can also input your paydays and see where your money is going. There is a small catch, however. In order for Prism to work, you have to be able to pay the bill online, and Prism has to be able to support whatever company you’re paying. When I first downloaded the app I didn’t really expect to be able to do much. I have quite a few bills that are scattered all over the place. To my surprise, literally the only bill I was unable to pay via the app is my utility bill (which the app says support is coming soon). My rent? Check. Car insurance? Check. Phone bill? Credit card? Car payment? Check, check, check. The app even allows you to add manual bill reminders so anything not supported (or even temporary bills) still shows up. The downside to the program is that it takes forever to set up if you’ve got a lot of billers. And believe me, you probably have more than you think. For every biller that you add to the app, you have to connect it via your account credentials and basically give the app permission to sign into your account for you and make whatever payment you request. You also have to hook your bank account into the app. Now, I know what you’re thinking: that’s a lot of sensitive personal information all in one place, right? Well, being the wary person I am, I did a lot of research before downloading it, and there are two things that made me actually rather comfortable with this app. First, none of the information you give to Prism is actually stored on your phone. It’s all stored on their servers and can be accessed via your device. Their servers have bank-level security (read more about that here) and users can add a PIN to the app so no prying eyes can peek at your finances. Second, the app really isn’t doing anything less than what you already do if you pay online. It’s literally no different. In fact, according to Prism, their system is more secure because you can’t hack an app as easily as you can a website or computer. Makes sense, right? I’ve been using the app itself for about two months now, and I have to say that it’s been amazingly convenient. There is occasionally a bit of a lag in bills showing up (my AT&T bill, for example, isn’t listed on Prism yet, but I can access it via the AT&T app on my phone as of yesterday). The friend who recommended the app to me has been using it without problem for four years and she hasn’t had any issues. To top it all off, the customer service for Prism is absolutely fantastic. You can message them right through the app (in fact, they often request you do that) and when I had to contact them with a problem it was literally fixed within 15 minutes. The second time I contacted them, it was a couple hours. For an app, that’s incredible customer service. Most developers and app support take at least a day to get back to you, in my experience. In short, if you’re looking for a better way to pay your bills online, I simply can’t recommend Prism enough. The app is great, it’s simple to use, it’s got fantastic support and customer service, and it’s just an all-around useful app to have. You can download it for free for your iPhone, Android, Windows Phone, or Kindle Fire. If you’ve still got questions or concerns, check out the Prism website for more information on the service.